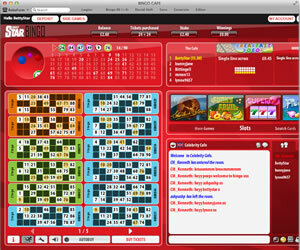 Daily Star Bingo originally launch in 1996 but vanished from the scene when the CyberBingo Network collapsed in 2011. The site then re-launched in May 2013 as part of the St Minver network alongside many other well known brands including ChitChat Bingo, Love Bingo and Vernons Bingo. The online bingo site is powered by the G2 software which may not be one of the most popular platforms out there, but it is certainly not the worst. As you have probably guessed, Daily Star Bingo is owned by the newspaper of the same name. They have used the newspapers red logo and black and white print as the basis of the sites colour scheme, and whilst it may not be too everyone's tastes, it is easy on the eye. When you land on the home page, you will be welcomed by Vinnie Jones who will let you know all about the free money and deposit bonuses you are entitled to. Click on the big 'Register' button and you will be asked to enter a few basic details and you will be up and running in a matter of minutes. Head into the Daily Star Bingo lobby and you will find tabs for bingo, slots, scratchcards, progressives, casino games and arcade games so you are sure to find something you will enjoy. 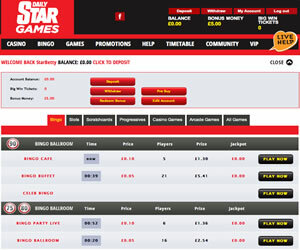 Daily Star Bingo offers 75 ball, 80 ball and 90 ball bingo through a small selection of rooms and from the lobby you can see how long until the next game, the price of the tickets, the number of players you will be competing against and the jackpot you could win; All handy information that will help you decide where to play. For some unknown reason the rooms seem to take a while to load, this may just have been a glitch at the time we were carrying out the review or it may be a problem with the software. Either way, once the rooms do load you will find they are nicely designed with the left hand side of the screen dedicated to showing the cards you have purchased with your best ones automatically placed at the top. 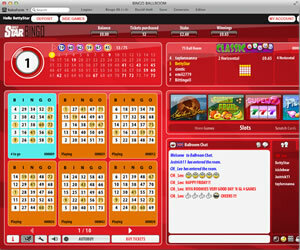 To the right of the screen you will find the chat room and a small selection of mini games that can be played without you having to leave the bingo room. You will find these games come in handy because at certain times of the day the bingo rooms are very quiet with just a few players present. One area where Daily Star Bingo does excel is promotions as the St Minver network always makes sure there is plenty going on. In addition to regular features such as free scratch cards, fastest finger days, guaranteed jackpots and value days, you will usually find monthly specials giving you the chance to win goodies such as gadgets or concert tickets. In addition to all of this, you will regularly find Daily Star Bingo hosting free bingo days with twelve hours worth of free games with real cash prizes. Daily Star Bingo is your average networked site, there are plenty of games and promotions on offer but nothing above and beyond those offered by all of the other online bingo sites that share the same network. There is not a week goes by without a handful of new sites being launched and this gives players the power to pick and choose the best ones out there and sadly Daily Star Bingo is not one of them. 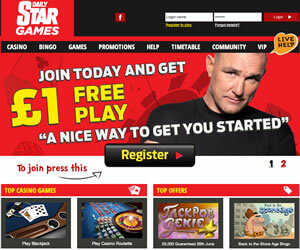 Daily Star Bingo offers 75 ball, 80 ball and 90 ball bingo as well as slots, scratch cards, casino games and arcade games. Wagering requirements are 10x the amount of bonus received if you are playing bingo but 25x if you are playing the slot or instant win games available at the site.